I heard this quote recently while listening to a podcast of the popular Radio 4 science programme, The Infinite Monkey Cage. It struck a chord because this statement seems very much to relate to the issue of pain. Treating pain is now big business, (probably because it is a big problem) Everyone from the more mainstream professions of Physiotherapy, Chiropractors and Massage Therapists to the more ‘alternative therapies’ (Reiki and Bowen Therapy to name a couple) claim to have the answers – or, all too often, ‘The Answer’. ‘The Answer’ to your pain will often depend on which health professional you go to see. Massage Therapists favour a diagnosis of ‘tightness,’ somewhere that needs ‘releasing’. The ITB, Psoas and fascia are popular culprits (sound familiar?). It’s also quite likely that if you see a massage therapist, you will have lots of knots (whatever they are) contributing to your discomfort. Chiropractors on the other hand, are likely to attribute the source of your misery to some misalignment (more often than not, in the pelvis), coupled with a difference in leg length, and possibly the odd vertebrae that has slipped out of place. With Physiotherapists (I’m not blind to the shortcomings of my own profession) it’s usually about weakness, frequently in the gluteal (bum) muscles (often hand in hand with a touch of hip flexor tightness). Bad Posture is also a Physio favourite, with a bit of asymmetry and imbalance thrown in for good measure. Of course, I’m being a little flippant here, and it’s a gross generalisation. What I am trying to say, is, if you see 10 different therapists, it’s likely you will get 10 different diagnoses (lots of you will have been there!) Even within professions, you are likely to be given a different reason for your pain. Why is this? How is it possible that highly qualified (for the most part), professionals have such conflicting opinions, each as confident as the next that they have the answer? Although a lot of these therapies are claiming to offer a unique fix to your problem, they are in fact very similar in their approach. They are all breaking the problem down to component parts. Find which part isn’t working properly and fix that part. But we aren’t machines, and the failure of the current health system to recognise and embrace the complexity of the system that is the human being is contributing to making society sick. It is true, we have made great gains in medicine. More people are surviving cancer, we are able to transplant organs, and the advances made in treating complex trauma are just mind -blowing. But when it comes to pain, we don’t seem to be helping much. In fact, it has been suggested, many of our interventions often make things worse not better. We blame the office chair, the screen height, but fail to take into account stress, lack of exercise or a bad diet. We blame poor core stability, but don’t consider sleep patterns, the effect of a bereavement, or divorce. We try to correct posture rather than a sedentary lifestyle. Telling people we can fix their pain with passive treatment engenders dependency. Blaming pain because bodies are misaligned, or a specific muscle is weak or tight suggests vulnerability and fragility, and misses out huge chunks of vital information. As therapists, we are failing our public. We are failing to help them see beyond the component parts, and help them understand the complexity not just of pain,but of how our bodies really work. By offering ‘The Answer’, ‘The Fix’ we are denying them the knowledge that our bodies are self- healing. People with pain don’t need fixing, they need information, they need guidance. They need to know what are the best conditions to help their body heal, when to rest and when to move. They need to understand how different areas of their life and lifestyle can help or hinder an injury. We need to help people get their heads around the fact pain isn’t just about structure, and that damage pain are not always a direct relationship. We need to help people understand that fascia can’t be released, joints realigned or scar tissue broken down, and that the ability to change their pain lies with them. I may sound like I am talking myself out of a job here. Absolutely not!! What I am saying is that at Revolution Sports Physio, although we are able offer some treatments that will make you feel better in the short term, we do not promote simple or instant fixes. We embrace the complex, and will help you do the same. It sounds scary, but it actually opens up a whole world of possibility. It means that often, you can keen running with that injury, it means you can head to the climbing wall instead of Pilates to help your back, it means you don’t have to be locked away in a room doing hours of boring rehab exercises (in fact we’d rather you didn’t). It means we will listen to what is important to you. 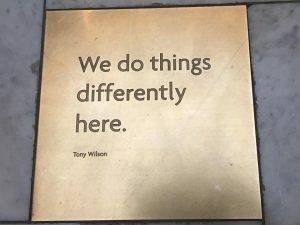 Because, at Revolution Sports Physio, to quote the late, great Tony Wilson, ‘We do things Differently here’. If you would like to know more about how we can help you with an injury, please give us a call or drop us a line.